In the deserted ‘Zowie cafe’ a mouse is disturbed a jukebox playing latin music. In his attempts to stop the machine, the mouse ends in a cocktail and gets drunk. He visions ‘spirits’ coming from the bottles who start a conga beat. 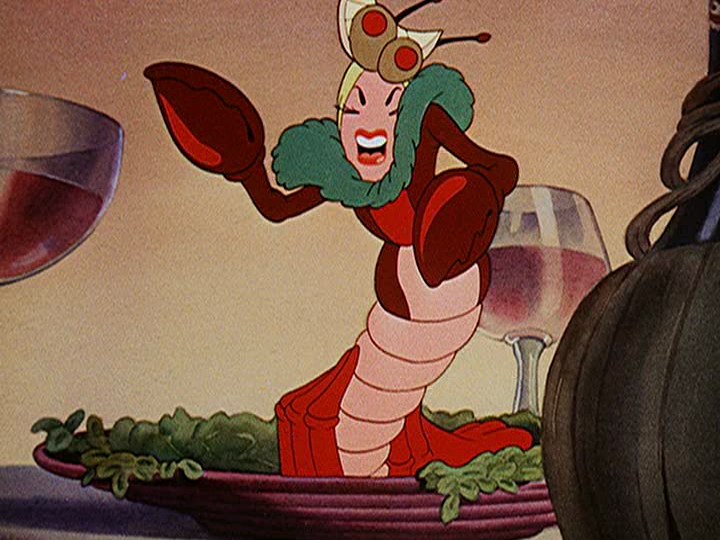 A lobster does a Carmen Miranda act, blending Cuban and Brazilian styles, and singing in some kind of mock-Spanish. The mouse happily joins in, until he returns to his home to sleep. The whole cartoon has a delirious atmosphere, and can be called ‘intoxicating’ without necessarily being really entertaining. The ghosts’ designs, with their red noses and bowler hats, are copied straight from the Mickey Mouse cartoon ‘Lonesome Ghosts’ (1938). Thanks for posting this, I remember it from childhood and I had a keen desire to see it again. The singing matchstick men and the dancing cactus particularly lodged in my memory. It’s not nearly as mysterious or interesting as I remembered but it’s still a charming minor work of that era.